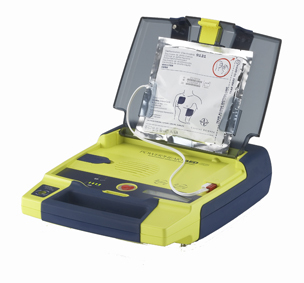 Supported with a 7 Year Full Warranty - one of the longest available for any AED on the market. Reliable and safe, providing intelligent cardiac monitoring and defibrillation technologies. Fast, effective and extremely easy to use, optimizing the potential to save life. RHYTHMx software technology quickly and accurately detects abnormal heart rhythms, determines whether they are life-threatening, and only delivers a shock when needed. If more than one shock is necessary, the analysis software utilizes variable escalating energy to deliver therapy at an appropriate higher level. Powerheart AEDs patented Rescue Ready® technology which includes daily, weekly, and monthly self-tests virtually assures the device will correctly deliver a shock the first time and every time. Powerheart AEDs are supported with a 7 year full warranty, one of the longest warranties available for any AED on the market. Powerheart AED G3 range automatically tests all three critical components daily including the pre-connected defibrillation pads (presence and function), Intellisense® lithium battery, and system. When the Powerheart AED fails any of its self-tests, an audible alarm and accompanying visual cue (a green-red status indicator) provides an effective alert to users. All testing data is stored within the device. Powerheart AEDs feature the industry’s first 4 year replacement battery guarantee. The intellisense Lithium batteries feature an internal analysis chip which records daily self-test data and provides charge level data to the onboard diagnostic software. Powerheart AEDs provide a visual script to complement the audible voice prompts. Especially useful for the hearing impaired, or for use in noisy environments, this screen also provides valuable rescue information (including the length of rescue number of shocks delivered) to EMS professionals when they arrive on the scene. Powerheart AEDs use pre-connected non-side specific pads that can be placed in either position on a patient. This means that either pad can be placed in the upper-right or lower-left chest position making pad placement much easier than other manufacturer’s pads.